Halliburton will pay $1.1 billion for its part in the 2010 oil spill in the Gulf of Mexico. The Houston-based contracting company has been embroiled in multiple lawsuits, from BP and local residents, for its role in the largest oil spill in U.S. history. 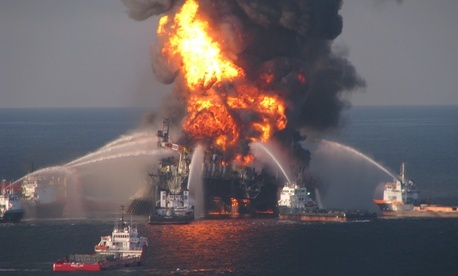 The spill occurred in April, 2010 when a blowout at BP's Macondo oil well caused an explosion at Transocean's Deepwater Horizon rig just miles off the Louisiana coast. Halliburton's cement work was identified as a contributing factor in the incident. The majority of the settlement will go to local residents and businesses who were seeking damages from the multi-billion dollar behemoth, the AP reported. Halliburton's investors will likely be calmed by the announcement, according toBloomberg, as the looming payouts were a sore spot for the future of the company. This is likely to be the largest sum. Attorneys for the plaintiff's praised the agreement in a press release on Tuesday. Halliburton stepped up to the plate and agreed to provide a fair measure of compensation to people and businesses harmed in the wake of the Deepwater Horizon tragedy," said Co-lead plaintiffs' attorneys, Stephen J. Herman and James P. Roy..
BP, Halliburton, and Transocean have paid significantly for their roles in the spill, which killed 11 and sent an estimated 4.9 million barrels of oil spilling into the Gulf. BP reached a $7.8 billion settlement in 2012, and Bloomberg is reporting that the company has already spent an estimated $28 billion in its response to the oil spill.